Let’s face it, I stink at updating blog posts. I’ve tried to make this a priority but family, job, fiction writing, and art takes my time. So no more apologies or promises of great stories. But the question still remains…What to do about the blog? I could give it up or let it fall into internet limbo. I could use it as a conversation starter: “Hey, I have blog which means I’m awesome.” I could also put random song lyrics to express my Emo and deeply buried angst, but that’s what MySpace is for. My dilemma: What can I put on a blog that requires the least amount of work yet is still interesting and funny? Trapper Keeper is pretty awesome, I know. I decorated it with stickers from my high school football team. Don’t hate on the style. I walked in my office at home, cleaning it as per my promise to my lovely wife, and in a stack of my old art projects lay Trapper Keeper. Now Trapper Keeper is old school. I’m talking when Trapper Keepers had the capability of being the equivalent to a portable Fort Knox. 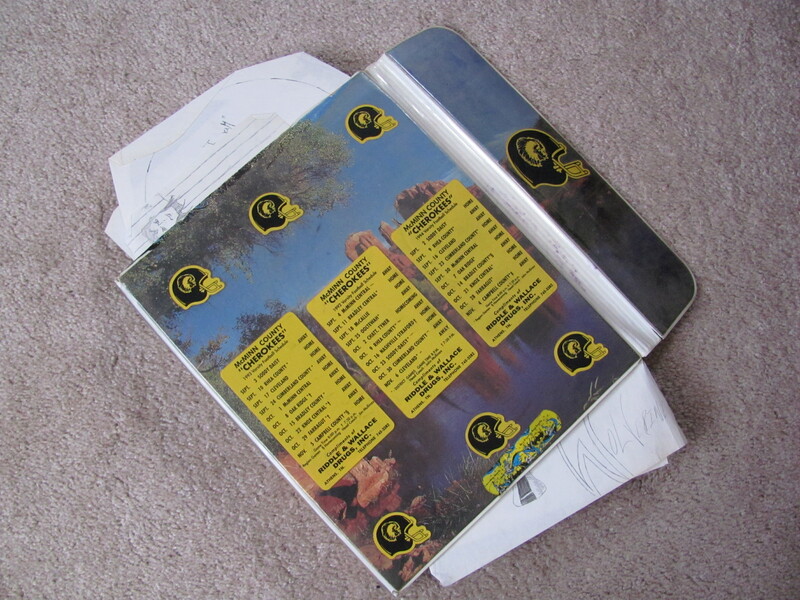 Multiple plastic zip pockets. Cool folders of Cats surfing in Hawaii. Covered in beautiful mountain ranges that would make Lee Greenwood cry a river with Justin Timberlake. Epic before epic was conceived. Now in Trapper Keeper I kept my drawings. Not just any drawings but creations 20 years old. I opened Trapper Keeper and low and behold before my eyes lay the worst possible crap that anyone could create. Drawings literally that could be confused with the work of a blind, no-armed, serial killer with turrets. Gazing upon these pages of garbage it hit me…Why not share these with the world??? There is a years worth of material here! Look at that! 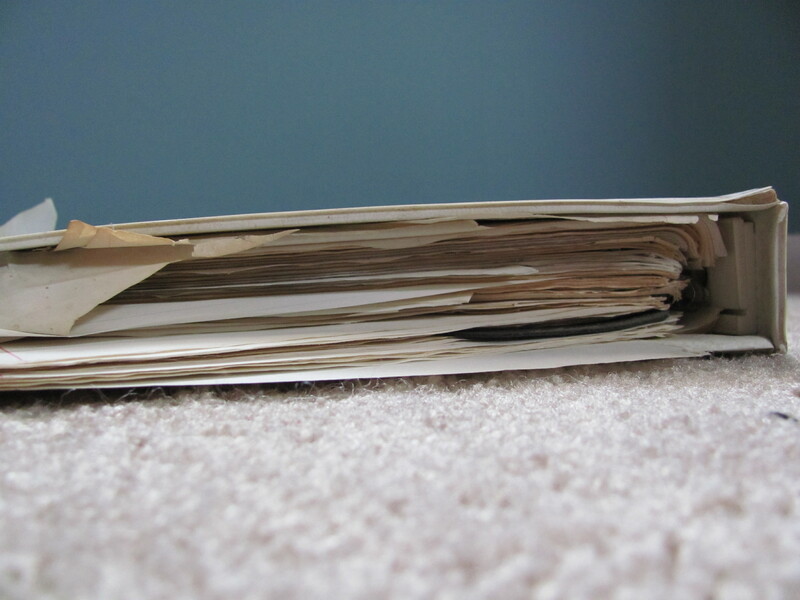 If paper had tear ducts, it would be weeping for euthanasia! Now this is something I don’t think I could have handled ten years ago. Now, I think it’s hilarious. My professional desires have always circled the creative (specifically art and writing). I have been blessed to design and sell t-shirts, posters, websites, marketing identities, illustrate children’s books, paint wall murals and personalized canvas paintings. I’ve even had ideas and completed works for a multi-million dollar company stolen and others take the credit. But why focus on the things that I’m proud of and take talent?? It’s time to shine the spotlight on trash that will make a toddler cry. Each week I will post a dynamic piece of toilet paper that I created as a kid with my commentary on what makes it original and completely horrifying. I will post drawings from Mortified the Trapper Keeper starting from the year 1989! Feel free to jump into the mix with your own observations and insight. 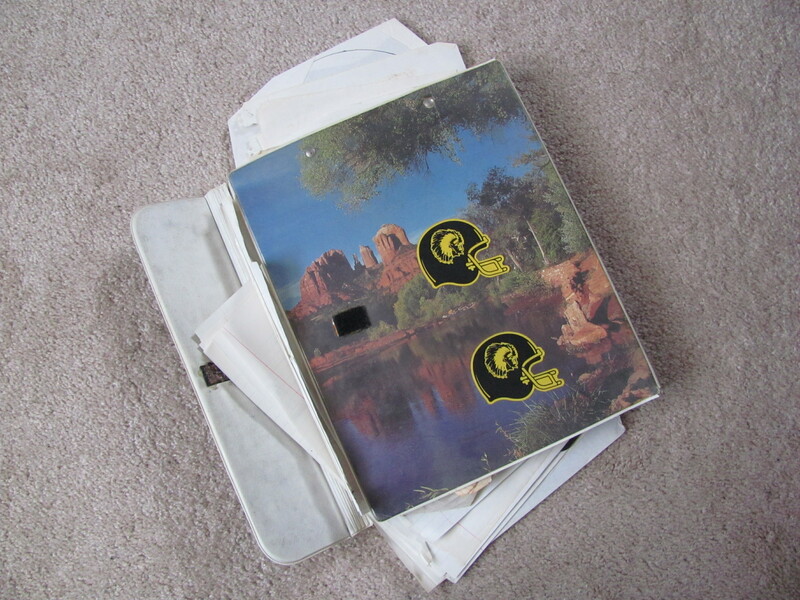 As you can see, the football theme grew to the backside of the Book of Shame. There’s also a Batman band-aid stuck below the bottom middle football helmet. Don’t ask, because I don’t remember why. This is a new Devotion book one of my friends, Bryan Gill, just published through Student Life. It’s called 31 Verses Every Teenager Should Know. Bryan is a great friend and you can check out his blog, it’s listed over on the right under my Blogroll: Big Dreams.